1975 was a time of economic uncertainty for the United States. Businesses and manufacturers around the country were looking for ways to cut costs. Topps was no different. For just the second time, Topps printed and released their annual baseball card set all at the same time, forgoing the multiple-series concept they used from 1952-1973. Unlike the previous year, the card maker experimented with a parallel release that saw the same cards released, only smaller. The result is 1975 Topps Mini, a classic baseball card set that remains a favorite with collectors today. 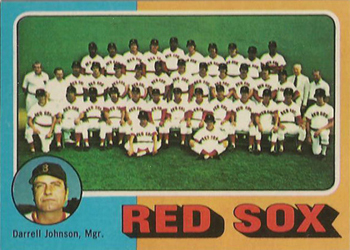 1975 Topps Mini set was identical to the regular issue with the exception of size and distribution. The cards were issued in wax packs that cost $0.15 each. 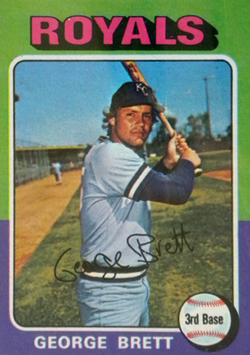 The set has 660 cards, including rookies of future Hall of Famers George Brett (#228) and Robin Yount (#223), who were featured on their own card. Jim Rice (#616) and Gary Carter (#620) have rookies on multi-player cards, a practice common at the time. 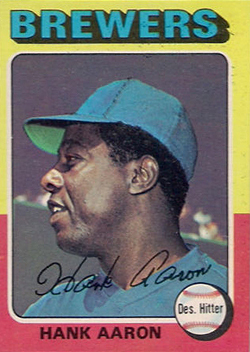 Several innovations were added to the product, including team cards with player checklists, highlight cards, MVPs, and All-Star designations. In a bit of an anomaly, Herb Washington (#407) has his position listed as "pinch runner." To date, this is the only time that designation has been used on a baseball card. The size of the 1975 Topps Mini cards was reduced from the standard dimensions to measure 2 1/4" by 3 1/8". With the smaller size, Topps was able to streamline the printing process and squeeze the entire run on five 132-card sheets. It also lowered production costs. The cards had very limited distribution in Michigan and California. 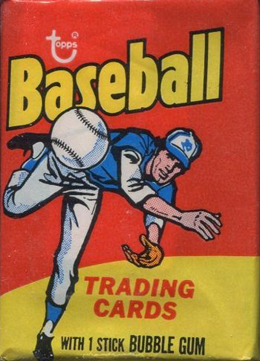 Besides traditional distribution channels, Topps pushed the cards to market using vending machines in addition to traditional distribution channels. This helped them get around retailers. The old cliché of “eliminating the middle man" was another way to save money. 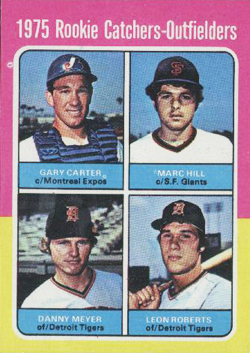 Collectors largely ignored 1975 Topps Mini for a long time. However, in recent years the cards have gained notoriety and acceptance. They compliment the beloved regular set very well. The PSA Set registry has swelled as deep-pocketed set builders realize that the limited distribution created an environment for a challenging chase. While exact production numbers have never been made public, 1975 Topps Mini is widely regarded as one of the most difficult sets to complete in high-grade condition from the 1960s and 1970s. The set's popularity is an impressive feat for a pint-sized cardboard oddity. The multi-colored borders that make the set so recognizable are extremely prone to chipping, edge wear and smudges. Many of the cards are mis-cut and centering is a major issue. In particular, the yellow and green-bordered cards are very difficult to find in Gem Mint condition, followed closely by the yellow and red-bordered cards. Quality control of the print run seems to have been nearly non-existent. It is believed that the most difficult card to find in top condition is Claudell Washington (#647). 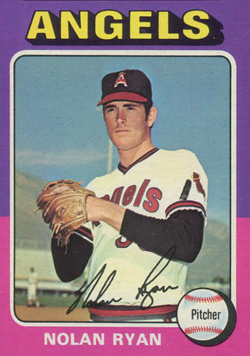 As the number of people collecting 1975 Topps Mini continues to grow, so does its legacy. Recognizing this, Topps recently used the loved set and design as an insert in 2011 Topps Lineage. Test issues have always fascinated niche collectors. It's fair to say that with 1975 Topps Mini, the set has gone mainstream in the mind of vintage cardboard aficionados. 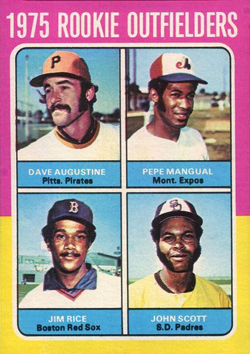 The 1975 Topps cards are excellent in their presentation, with bright colors, and good photography. The mini set, with its limited production, is a great supplement to the regular cards. 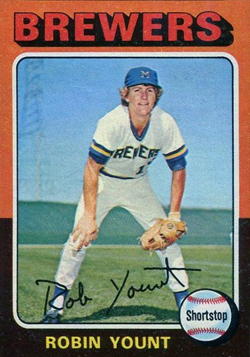 1975 Topps Mini Milwaukee Brewers Baseball Card #223 Robin Yount RC - Mint? 1975 TOPPS MINI BASEBALL UNOPENED CELLO PACK!! Brett, Yount, Rice, Carter RC?